A veteran cop faces his toughest opponent: City Hall. The Baltimore City Fraternal Order of Police Lodge 3 in Hampden is part clubhouse, part HR office. In one room, officers go over paperwork regarding leave time and benefits. In the next, a neon police car hangs over a bar where off-duty cops swig beer and watch SportsCenter. Upstairs, FOP president Bob Cherry toils in a busy but tidy office. A Norman Rockwell poster that shows a kind cop stooping down to help a little boy hangs behind his desk. On the floor are stacks of paperwork, some of them related to the union's long-standing struggle with City Hall over police pensions. Others, research about accidental police shootings. Cherry, who's been a cop for 18 years, always wanted to work in law enforcement. "The model of public service was put in me as a kid," says Cherry, who grew up in a working-class town south of Boston and still has the Southie accent to prove it. "I believe that there are some folks who have that calling." Unlike most cops, Cherry spent years working with inner-city kids before he joined the force. After graduating from Boston College, he worked as a case manager and team leader for Baltimore's Choice program, which provides outreach and support for troubled young people. For three years, he counseled and tracked kids in Cherry Hill and East Baltimore. "It was frustrating," says Cherry, who has lived in Baltimore City since 1990. "All these kids, their neighborhoods were ravaged by poverty, no jobs, drugs everywhere—the one avenue where you would hope they would get some security would be school and, back then, they were pretty bad." Still, Cherry fell in love with the city. "It's like Boston: the blue-collar, tight-knit neighborhoods," he says. "I realized that this is a city that I want to work to improve." In 1993, Cherry became a police officer, quickly rising through the ranks, working on the Violent Crimes Task Force, and ultimately, as a detective in the homicide division. 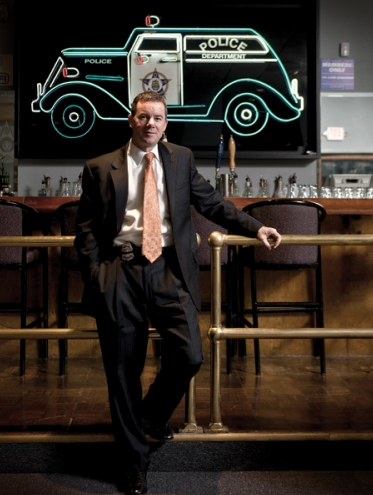 In 2008, his colleagues in the FOP elected him their president, taking him off the streets. It's been an eventful three years. The recession and cuts in the city budget have meant near-constant battles with City Hall over salary, benefits, and pensions. Three police officers were killed in the line of duty in the past year. And this year has brought a string of controversial incidents, including an accidental police-on-police shooting in January and the arrest of 19 officers in an alleged extortion scheme in February. "I wish I was back on homicide," says Cherry—not at all kidding. "It's hard to keep everyone happy up here, whether you're dealing with City Hall, command staff, or even the men and women who you represent." Relations with the City Council and Mayor Stephanie Rawlings-Blake headed south last year when the council drastically cut city contributions to police pensions, reduced benefits, and eliminated tuition reimbursement. Cherry was particularly miffed that the mayor helped kill a bill allowing the city and the FOP to enter binding arbitration and shot down an FOP counter-proposal to the city's changes in the pension plan that, he says, would have matched City Hall's cuts. "You show up at our officers' funerals and say 'good job.' You go on TV and talk about the reduction in crime and say 'good job.' But you won't sit down with us who, though we disagree, have come a lot further than unions across the country," he says. "It's unfortunate." Ryan O'Doherty, a spokesperson for the mayor, says the pension legislation included many fiscally responsible compromises. "The mayor was concerned about getting the pension system funded so it would be there when police officers and firefighters need it," says O'Doherty. "Bob Cherry was more concerned about keeping a system where government employees retire in their early 40s with a full pension after 20 years." It got so bad that the FOP filed a federal lawsuit against the city and helped pay for billboards that read: "Welcome to Baltimore. Home to a Mayor & City Council who turned their backs on our police and firefighters." "It's frustrating that I have a strained relationship with folks at City Hall," says Cherry, who hasn't talked to the mayor in six months. "I think we can bring a lot to the table." Cherry is looking into a performance-based contract for cops, like the one the Baltimore Teachers Union recently signed. "There's less money going around," says Cherry, who's a fan of ousted D.C. schools chancellor Michelle Rhee, who also favored performance-based contracts. "We have to find ways to streamline our services without giving up on the goal of public safety." Above all, says Cherry, his most important priority is making sure his fellow police officers get the respect they deserve. "There are a lot of intelligent, hard-working men and women in the Baltimore Police Department that can make Baltimore a stronger place," he says. "I love representing them."